The Combustion Turbine is similar to a large jet engine which has its hot exhaust directed to a power turbine. Natural gas is ignited and burned. 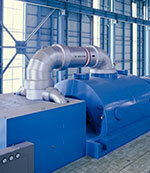 The turbine converts the linear thrust into rotational energy which then drives a generator. Since there is no steam component to the power plant and thus no condenser cooling water necessary‚ gas turbine plants can be sited nearly anywhere. Turnkey installations can be up and running in as little as a few months. The primary fuel is natural gas‚ however‚ in some instances these power plants have back up systems supported by liquid fuel or diesel (distillate) oil although residual oils and occasionally crude oil have also been used to initiate the combustion reaction. When liquid fuel is something other than distillate‚ a fuel treatment system is usually provided by the gas turbine OEM to remove undesirable components in the fuel which would otherwise cause excessive corrosion in the gas turbine system. Such systems have main- and standby-fuel transfer pumps. The burner or fuel injection pumps are usually high pressure pumps (to 1800 psi). The gas turbine may be started and stopped using clean distillate fuel oil while using a heavy residual fuel for normal running. This puts a demand on the injection pump to handle a wide fuel viscosity and temperature range. 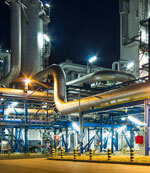 NAPTHA has been used as a liquid fuel when available as a surplus refinery byproduct. 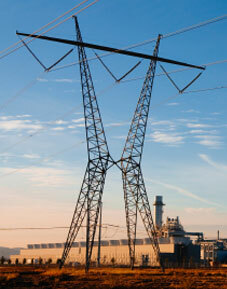 CIRCOR brands Warren and Tushaco two screw pumps are successfully used in power plants burning NAPTHA. 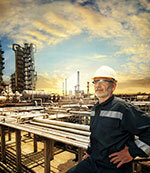 CIRCOR brands Allweiler‚ IMO‚ IMO AB‚ Warren and Tushaco supply product into natural gas power plants. Global combustion plants have turned to CIRCOR brands to provide a wide variety of pumping solutions with technologies that include three screw pumps‚ two screw pumps‚ crescent internal gear pumps‚ progressing cavity pumps‚ centrifugal pumps‚ as well as lubrication solutions that include the PurLube and the Oil Mist.